A constant 5-year life cycle is assumed for these traditional PCs over all the historical data. This greatly simplifies the computation of the total size of the installed base at any given point in time as the the sum of all the unit sales over a trailing 5-year moving window. Similarly, a standard 2-year life cycle is assumed for mobile PCs. iPods and iPads (and other tablets, PDAs, etc) perhaps have longer life cycles and iPhones (and phones in general) probably have slightly shorter average times before upgrading, in my opinion a reflection of the carrier subsidy model for phones. But I'll keep things simple and just use the industry standard 2-year service contract as a proxy for the average lifetime of all these devices. Also as a result of this simplification, hand-me-down expansion of the user base would not show up in this methodology until those users upgrade their device with their "actual" first purchase on the record. Certainly not all customers wait exactly 5 years to upgrade a PC (as this assumption implies). Some may do so sooner, some others may wait longer, and some simply don't upgrade at all (deaths, bankrupt businesses, and switchers come to mind). Further, the real average life of a PC is definitely not constant over time. Even though there are other ways to model replacement cycles for a customer already counted in the installed base, as well as ways to model churn (customer defection) and hand-me-downs separately, the simplified computation gives figures roughly in agreement with other estimates of computers in use at different points in time (see here and here) and is still useful for identifying saturation from the sales data alone. In addition to installed bases and their changes over time, I'll use line charts to highlight some selected relationships, like their relative growth (y'/y) as well as comparative concepts like the penetration of one customer base into another, a slower-moving metric than the typical market share of current sales. This is all derived from the long term unit sales data for the whole traditional PC and mobile PC industries compiled by Asymco's Horace Dediu, who in turn built on data compiled by Jeremy Reimer (I've updated it with the latests results from Apple and a few fixes I thought necessary). In the chart above (which I had introduced previously without further description or interpretation) the stacked bars represent the addition of millions of new customers (or, rather, new computers in use, since the same customer might need two or more PCs, or several customers might share the same computer) for every year. So we see the annual increments in adoption of PCs, both traditional (light orange bars) and the new mobile kind (light blue bars) stacked on top. I've included the iPod line within this mobile type since, in my opinion, that is precisely what the iPod's long-term evolution eventually pointed at. But even from its initial conceptualization, I believe the iPod perfectly met a broad definition of personal computing as its very name implies. We are so used to associating iPod with music that we've practically lost the actual general meaning of the word 'pod' as just a shell, a capsule, a protective enclosure, and most significantly a more agile transport vehicle of all the (mostly finished) digital stuff freed from the bulky and stationary computer, stuff we might want to keep with us at all times but couldn't. An apt metaphor: just like dumb terminals were the trojan horse that enabled the PC revolution against monolithic mainframe computing, the iPod freed us from our desk-constrained computing needs, paving the way to mobile computing. It just happened to do it first to music, then simple contact information, photos, basic video, some very simple games, and only after gaining touch input, can now be seen as a full fledged computing device as part of the iOS platform and app ecosystem. Recessionary periods are highlighted in gray, and you can see their temporary slowing effect on the adoption of PCs. Line charts for market share of unit sales for Apple ][ computers in brown, Macs in orange, iPods in light blue, and iOS devices (iPhone, iPad, and iPod touch) in dark blue reveal the cycling patterns and shifting trends of adoption and disruption (declines) of these evolving computing form factors and their associated technological innovations for Apple. The aggregation of all these (in unit terms) results in the dotted line for all of Apple. Early Mac expanded within the PC base to almost meet the prior Apple ][ cycle but never exceeded it in market share terms before receding into irrelevance. This century's recovery has only brought the Mac up to 1/3 of it's early '90s peak, obviously indicating much better competitiveness of the products but also helped by the halo effect from the iPod and iOS insurgence, as well as by a slowing adoption of all traditional PCs in the last 4 years. Again, it is still only 1/3 (of a total market more than 20 times bigger) suggesting further room to grow despite the potentially receding industry-wide trend. When aggregated with iPod, Apple's total share (the dotted line) surges following a clear s-shaped curve in the mid 2000s, only to reach the same level originally achieved by the Mac in the early '90s. Even adding all iOS devices to the Mac is not enough to reach that fleeting spike of Apple ][ and Mac combined 25% share of units sold in 1984. 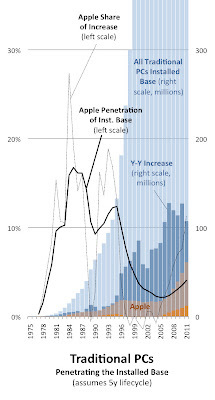 Thus, one could say the Mac merely replaced the Apple ][ in penetration levels (while expanding greatly with the market) and iOS has only restarted the iPod impulse (as evidenced by the recent emergence of the lower part of a new sigmoid in the dotted line). 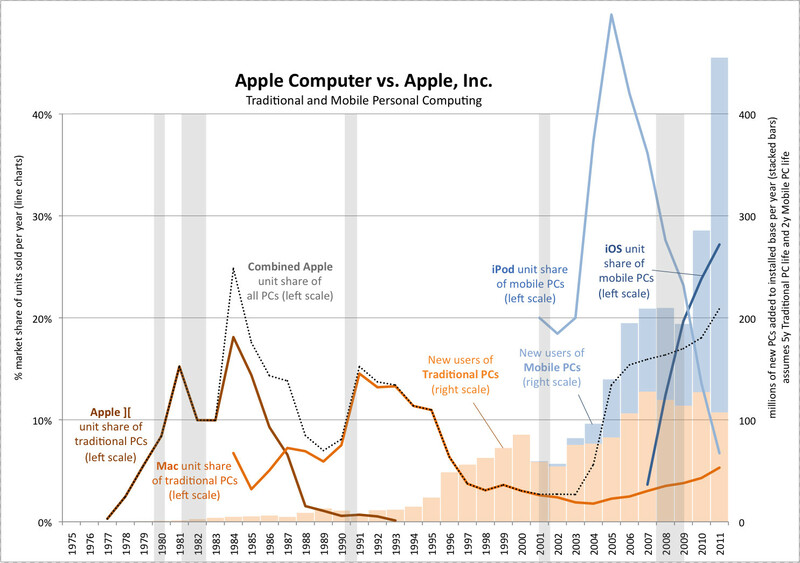 As for the overall market, the exponential adoption of PCs seems to be restored only when considering all computing by the addition of the mobile devices user base (blue bars), although it's too early to tell if these are all additive (as implied by the stacking in this chart) or substitutive (like Mac vs. Apple ][) or more likely partially substitutive (like iOS vs. iPod+Mac). After only a few years worth of expansion, the yearly new mobile computing users are already far outstripping the yearly new users of traditional PCs. 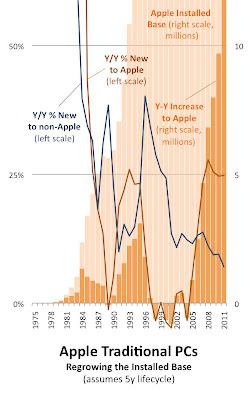 Now I'd like to provide a more detailed picture of how the traditional Apple PC adoption fared within the overall PC expansion, by focusing on those orange bars and showing the Apple user base changes within them. But also, I'd like to show how these yearly incremental adoption levels compare to the overall size of the whole traditional PC installed base. This gets tricky due to the orders of magnitude difference between these two sets of measures (rate of change y' vs. total size y). When I first tried to visualize the long-time history and evolution of Apple's and the industry customer bases, for both traditional and mobile computing, I right ahead noticed the convenience of using a log chart, as Horace did. However, once I did that, all the incredibly huge disproportion between some of the numbers (a critical aspect in the potential for growth that I'm trying to convey in my analysis) got lost, at least visually, in the logarithmic distortion of the vertical scale. I was finally convinced the linear scale was the best way to highlight the still untapped potential for growth after I remembered something else Horace had showed me all through his work: that it's okay to play with non-conventional chart dimensions. So I came up with the following two charts focusing on the yearly increases of the overall computing market with Apple dwarfed at the bottom (in the first), and for Apple's installed base on its own (for the second) over all its history. The progression dives in orders of magnitude from bigger customer bases to smaller ones, zooming into the relevant customer segment at each step. Vertical scales go from several billion units in use (in theory, if that previous chart above were to include the total customer base for all PCs, mobile or not) to a hundred million for each tick mark (all traditional PCs), to 5 million per tick mark (Apple alone). As a result, for these two next charts you can only see the bottom (and perhaps most informative) part of the chart here, since I had to crop them, but you should click on each of them to get the full perspective and visualize the magnitude of the whole installed base compared to what gets added to it every year. The full chart images are 5 times taller than what's shown here inline, towering 4 thousand 1600 pixels in height (blogger scaled them down but they're still readable). So as I mentioned, for this next chart I wanted to include the whole 1.5 billion user base for all traditional PCs compared to the yearly changes (y'≈∆y) which you already saw above in orange bars. Only now I've changed the color schemes a bit, and those orange bars are now shown in dark tones, with the total user base represented by lighter bars which get cropped in the last decade or so (left image, remember to click on it for the full version). And now, the whole Apple installed base appears in sort of grayed-out orange tones, (somewhat shockingly) all of it always contained within the dark blue bars (except in '87 and '91, slow years in industry-wide adoption, when the Apple base barely edged over the dark blue). This bears repeating: just the new PC users added on any year outnumber the total Apple installed base accumulated throughout all it's history, and by a very wide margin in the last couple of decades (although that gap is beginning to close in recent years). The yearly additions (or declines) for Apple alone now appear in brighter orange, barely visible in the early years and only in recent years developing a discernible trend towards catching up to their "comparable" industry-wide dark blue bars. As mentioned for the previous chart, despite the continuously growing installed base for all traditional PCs, the dark blue bars (yearly adoption of new PCs) show temporary slowdowns in 1990-91 and 2001-02, and a more persistent stall in new users since 2008 which has not been overcome. There are slowdowns, and even declines, for Apple adoption as well, but too small to appreciate in this chart. The two overlaid line graphs show the user base share ratios for Apple, within the total installed base in a thicker continuous line (a "slow" signal), and its share of just the newly added customers as a thin dashed line (a "fast" signal). Notice how the crossovers of these two lines mark the beginning and end of periods of expansion or decline in installed base share. And when they remained at similar levels for a year or two it signaled share saturation for Apple, and steep declines followed. The dashed line is currently a safe distance above the thick one, signaling that the current Mac expansion should continue. In fact, at almost 3x as high, the separation in relative terms is as high as ever. And yet the slow moving thick line is still less than a third (as mentioned before when discussing share of units sold) as it was at its most recent peak in the '90s and less than a fourth of its 1985 absolute peak, again, these shares within a market that is more than 20 times bigger. All of this suggests to me that the potential for Mac growth is practically unlimited, even if we were to assume that tablets and other mobile devices will eat up half of the overall market for traditional PCs. The second chart (right, remember to click for the full "tower" chart) now focuses on Apple's own customer base of traditional PCs. Imagine from the previous chart, stripping out the blue bars (both dark and light) representing the non-Apple PCs, and then zooming into just the orange bars, stretching the vertical scale by 25x. As before, the darker orange bars represent the newly added Apple users joining the installed base each year (rate of change or ∆y≈y'), and the lighter ones towering above them are the accumulation of these changes over all previous years, i.e. the total size of the installed base at any given year (y) is given by the top of the light bars. So now we finally notice the 3 distinct periods of expansion of the Apple installed base, with each expansion reaching a much greater number of customers. 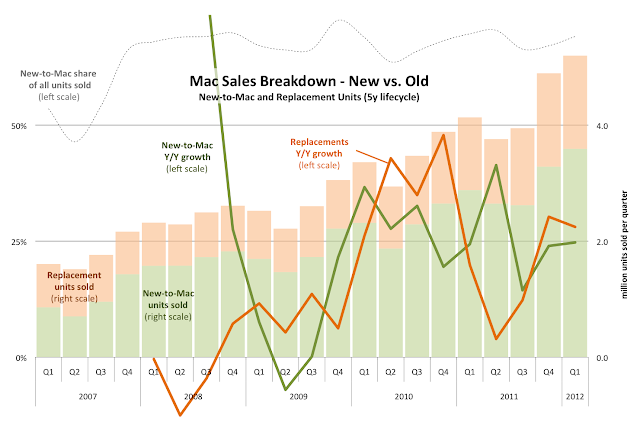 The first two completing their whole cycles of saturation, peak, and declines in growth (Apple ][ and early Mac), then a decade-long period of stagnation and declines for the Mac installed base, and then a resurgence over the last 7-8 years, bringing back exponential growth thanks to the adoption of Mac OS X, as can be seen by the rate of change continuing to climb straight up with no inflection to be seen so far. Also, there's a line for the ratio of dark bars over the total height (which is precisely the y'/y relative growth) in orange for the Apple computers in use, as well as a line for the same ratio but for non-Apple computers (the ratio of blue bars which were stripped from the previous chart). These boom and bust (and boom for now) cycles can also be seen reflected in the relative growth rate line, as well as the opposite effect when it was the non-Apple installed base which boomed in 1989 and late '90s. Currently the Mac user base is growing steadily at about 25% y/y (something unprecedented for more than a couple of years), while the PC base growth is at 7% and dropping fast (from nearly 14% in 2007 and a staggering 40% in 1996). That trend is expected to continue. A note about the correct interpretation of these dates when trying to ascertain causality of the patterns observed against the major milestone events in the industry (1984, 1995, 2001, 2007 and such): a lag of a few years is to be expected (between 2 to 4) for any potential causality relationship with any known event before it shows in the data, because these installed base figures are derived from trailing 5-year windows worth of sales (which nevertheless is convenient in order to reveal the slow patterns of adoption and smoothes out the relatively noisy signals present in the yearly sales data). I'll close this already too long second part of this series with a close up view of the last few years of Mac unit sales (now on a quarterly basis), broken down by those units that represent new additions to the installed base (green) and those that would be replacements (orange), overlaid with the y/y growth rate line charts for each, and the ratio of new-to-Mac over the total. I'll leave the interpretation to the reader. Once again, I believe it's only when one sees the whole context of these installed base numbers in the full "tower" charts, that one can appreciate the implication of continuing to add that 25% yearly increase over such a big installed base, which in itself has a 25x bigger PC user base to eat into. And this huge potential is just for Apple's Mac customer base; no iPods, iPhones or iPads are considered. That part of the analysis will take me a few more days. Stay tuned! This is amazing, Daniel. Thanks for all your work. I'd love to see a graph that goes out beyond 2012 but don't know if it's safe to speculate what that might look like. Very interesting. The line on the "Traditional PCs" chart is like a MACD signal. Incredible analysis and visualization. It took me some concentrated reading for which I needed to reserve an hour of interruption free reading. Very well worth it. Keep going Daniel. Thanks.